Nylon twisted eye and eye slings are practical multipurpose lifting slings that can be used in choker, vertical, and basket hitches. Two eye loops are twisted perpendicular (90°) to the strap and are located at each end of the sling body. The twisted eyes fit snugly against crane hooks and work well in choker hitch applications. Made in the USA, CORE™ Nylon Slings are known for their quality and safety features. Our nylon webbing is specially designed for slings and offers greater resistance to abrasion. CORE™ Nylon Twisted Eye and Eye Slings are tagged with a heat-imprinted sewn-on tag and meet or exceed all present OSHA and ASME B30.9 Standards. Nylon twisted eye and eye slings are available in polyester and in varying configurations and strength capacities. Contact our industrial lifting specialists at 888-794-0587 Monday - Friday, 7am-5pm CDT if you do not see what you are looking for. Chances are we can have our factory fabricate a sling to meet your lifting needs. 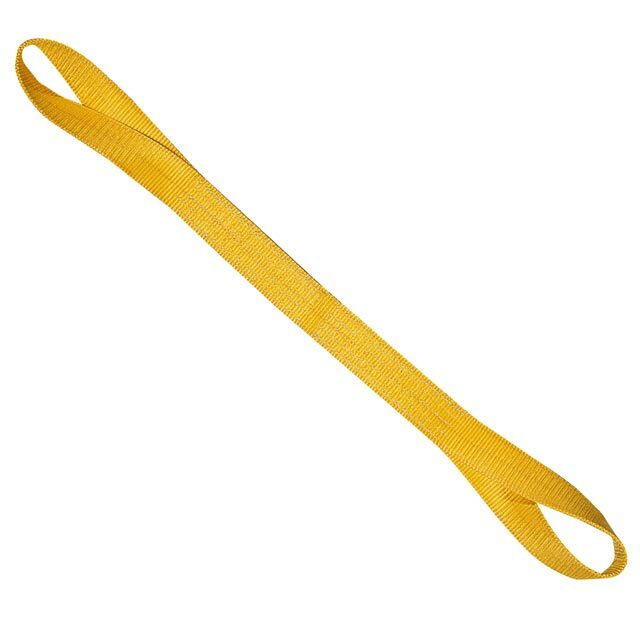 CORE™ Industrial Lifting Slings offers Eye and Eye slings in Nylon Flat Eye and Eye (Type 3) or Polyester Eye and Eye Round.